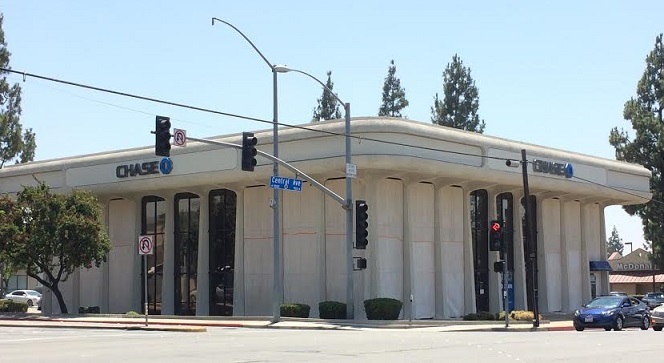 Perhaps the bank at Central Avenue and Moreno Street in Montclair isn’t truly a good example for my Mod! category of midcentury modern architecture, as the building, originally an American Savings, was built in 1973. Then again, as names go, Mod! 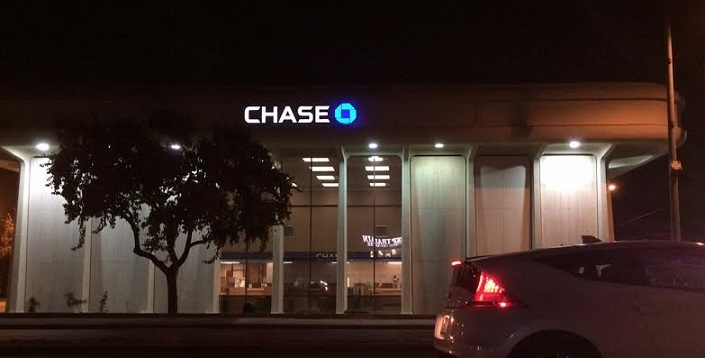 is somewhat elastic, and the bank, across from Montclair Plaza and near the 10, always catches my eye. I’d never heard of American Savings, and I can’t find any information about it online, but I’m told that like Home Savings Bank, American had a distinctive design that is still immediately recognizable. Like a giant concrete mushroom, the building appears to rise from the earth fully formed, including a cap that hangs over on all four sides. A few months after the Upland Earthquake of March 1, 1990, damaged travertine panels on the exterior were removed, according to the city’s planning department. American was converted to Washington Mutual in 1998 and to Chase Bank in 2009. I drove by one night last week and, stopped at a light, was struck by the floor to ceiling windows, which blend in with the building during daylight hours. Have you seen the building? Did you or do you bank there? Worked for American Savings….back in the day Home Savings and American Savings were the leading S&Ls in California, but then in the 80s Reagan helped roll back the strict regulations that governed the industry, which was promptly plundered by greed heads who quickly destroyed the industry. As a young man I was able to emerge from the wreckage reasonably intact, but saw many older colleagues wiped out by the carnage, and I learned never to trust management. The latest Wells Fargo fiasco seems to show that many others have failed to learn a simple truth: left without strict regulations and oversight, corporate management will steal everything in sight. Ha! Yes. Thanks for the personal story and commentary, James.